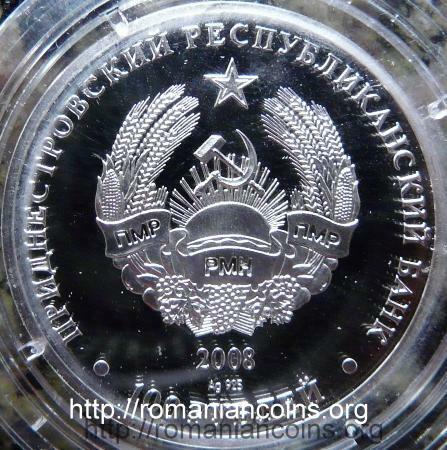 Obverse: denomination "100 RUBLEI" (Cyrillic), coat of arms of the self proclaimed republic of Transnistria (bearing hammer and sickle), inscription "· PRIDNESTROVSKII RESPUBLIKANSKII BANK ·" (in Cyrillic and Russian) meaning "[TRANS] NISTRIAN REPUBLICAN BANK", year 2008, below Ag 925, the silver fineness Reverse: a picture of the field marshal, next the coat of arms of the Russian Empire and, on a sheet of paper, the representation of a cavalry attack (in his youth the marshal was cavalryman), inscription "GENERAL-FELDMARSHAL P.H. 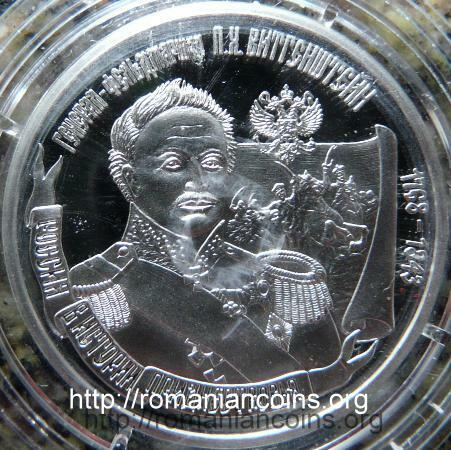 VITGENSHTEJN 1768-1843" and, on a ribbon, ROSSIYA V ISTORII PRIDNESTROVYA, meaning "GENERAL FIELD MARSHAL" and "RUSSIA IN THE HISTORY OF (TRANS)NISTRIA"
The coin belongs to a series named "Russia in the history of (Trans)Nistria". The series also comprises the 100 rubles 2007 coins with field marshal Pyotr Rumyantsev, with field marshal Grigory Potyomkin and with general in chief Piotr Panin and a gold 5 rubles coin from 2009 with Russian Empress Catherine II. Ludwig Adolph Peter Wittgenstein (1769-1843) was officer in the Russian imperial army. He fought in the Napoleonic Wars. In 1806 he fought against the turks. In 1828 Wittgenstein commanded the Russian army in the war with Turkey. After crossing over Moldavia and Walachia, the Russian army operated on the right bank of Danube River. The picture of Wittgenstein on the coin was taken from a painting of English portrait painter George Dawe, picture from Hermitage Museum in St. Peterburg, Russia. The field marshal was born at the beginning of January 1769 (Gregorian calendar), or at the end of December 1768 (Julian calendar). The initials of the name written on the coin are P. from Pyotr and H. from Hristianovich - in agreement with Russian tradition, because the name of his father was Christian (full name: Christian Louis Casimir zu Sayn-Wittgenstein-Ludwigsburg).